March | 2010 | Climate Science: Roger Pielke Sr.
experienced, the winter of 2009/2010 reminded us of the global cool weather rather than global warming. The occurrence of the extreme AO minus (3 sigma) provided us additional evidence that the AO controls a large fraction of global warming. “In this study, we investigate the mechanism of the arctic warming pattern in surface air temperature (SAT) and sea ice concentrations over the last two decades in comparison with global warming since the 1970s. According to the analysis result, it is found that the patterns of SAT and sea ice before 1989 are mostly determined by the Arctic Oscillation (AO) in winter. In contrast, arctic warming patterns after 1989 are characterized by the intensification of the Beaufort High and the reduced sea-ice concentrations in summer induced by the positive ice-albedo feedback. (1) The most dominant trend in observation for 1950-1999 shows an AO pattern (natural variability), while the most dominant trend in the IPCC models shows an ice-albedo feedback pattern (anthropogenic forcing). (2) In the observations, the AO pattern appears as the EOF-1. However, in the IPCC 10 model mean, the ice-albedo pattern appears as EOF-1 (which is not seen in the observation), and the AO pattern appears as EOF-2. (3) In the EOF analysis, the ratio of variance for the ice-albedo and AO patterns are 5:2. Since the AO is a realization of a stochastic process, the variance of the AO pattern in the observations dominates the ice-albedo pattern (5:20 in theory). (4) Multi-decadal trends of surface air temperatures [SAT] indicates that the AO was negative for 1950-1969, the AO was positive for 1969-1989, and the AO was negative for 1989-2008 (2010 is the extreme value). Those are realized as the natural variability superimposed on the general trend of global warming. According to our result, the rapid warming during 1970-1990 contains a large fraction of unpredictable natural variability due to the AO. The subsequent period of 1990-2010 indicates a clear trend of the AO to be negative. The global warming has been stopped by natural variability superimposed on the gentle anthropogenic global warming. The important point is that the IPCC models have been tuned perfectly to fit the rapid warming during 1970-1990 by means of the ice-albedo feedback (anthropogenic forcing) which is not actually observed. IPCC models are justified with this wrong scientific basis and are applied to project the future global warming for 100 years in the future. Hence, we warn that the IPCC models overestimate the warming trend due to the mislead Arctic Oscillation. Recently we published 2 articles, along the same line, about the coupling of wind parks to the electricity grid. The first is based mainly on German data. The second on Dutch data. The latter contains actual info on fuel efficiencies of the national power network plus some info on the energy costs of windmill installation provided by one of the firms heavily involved in the set up of wind parks. One’s nightmare is another’s challenge. A 1MW turbine is about 50 meters high and has a rotor of 50 meters and on the order of 150-200 tons. This is the massive contraption Hank is talking about. Most turbines sold in Europe and US today are 2-3MW, which in turn means that you need 300-500 and not a thousand. This is only in nominal effect, as turbines for onshore have a capacity factor in the range of 0.20-0.40 depending on site and a conventional power plant 0.8-0.9. So we’re not right back to a thousand turbines to make the same amount of electricity as a conventional plant, but not far off either. Most turbines cut in at a wind speed of 3-4 m/s, reach their nominal production at 12-15 m/s and cut out at 25 m/s. A wind turbine is not dangerous at 20 m/s or at 30 m/s. A wind turbine is dangerous when there is nothing that acts as a brake on the rotor, and since this condition of overspeed will destroy the turbine, there are several safety systems to prevent this from happening. Most turbines made today are pitch controlled, meaning that the blades attack angle can be controlled. If just one of the blades are perpendicular to the rotational direction of the rotor, it will stop the turbine. Hence there is a safety system for each blade, that is activated by the speed of rotor. With three blades there are three independent brakes. Accidents stemming from overspeed do happen. Mostly on older turbines, mostly due to poor maintenance and/or human error. Todays turbines are made to be remote controlled, and the operator can sit anywhere in the world and log on to his wind park and individual wind turbine. However there is not much to operate, as the turbines control and surveillance system employs maybe a thousand sensors and several computers, all bound together with fiber optics. Conventional power plants does not run at half power, and often they are divided into units of 600-800MW and instead of running two units at half power, you close one of them. The economy of doing such a thing depends on the economical structure of the power station in question. For nuclear, variable costs are low and fixed cost high, hence it is most economic to run it as much as possible. In the other end there are gas turbines, where the variable costs (price of fuel) is high and fixed costs are low. A wind power plant (as that is the size these come in today) has its own internal cabling and just one point where it hooks up to the grid. As the turbines are located pretty close together, in reality it is not as bad as Henk make it seems. For onshore parks, roads are made so the turbines can be transported to the site. The repair crew uses the same road and so far this has never been a problem. Turbines has been put up in mountains and deserts and in the arctic, and this has never been a problem. For offshore it is a little different. In the winter access to these turbines are often problematic, due to waves. It is not fun to jump from a ship in 1 meter waves with 50 kg of tools and spare parts. The waves can prevent access to a turbine for weeks or months. So if one breaks down, service personnel is flown out. The alternative is that the turbines may be stopped for weeks. To me it does not really matter if it is green, but lets see anyway. The motor of a helicopter may be 300kW compared to the turbine rating of 3MW. It is pretty simple that the turbine only needs to produce energy for a very short time to catch up for the co2 from the helicopter. So I guess that technically it is green, if that is important. For me it is a question of economics. A turbine that does not produce energy means that the owner of the turbine is losing money, because just like a car, the bank still wants its payments if you drive in it or not, and the same goes for turbines. And the helicopter is easily paid for. As with anything else, ice will accumulate on them and render them ineffective. For most places on earth this is not a problem, as the ice will melt in a few days. For arctic turbines it is different. Enercon has a system that can defrost the blades and others are also working on such systems. Dirt on the blades is a issue, but various coatings are used and some washes the blades with intervals. This has also been a problem in Denmark but it is a part of the learning curve of integrating more wind energy into the grid. In Denmark the grid operator can shut down turbines in such an event. Also the energy produced by the turbines is sold to market price plus a premium, so when there is more energy due to high wind, the price goes down and it becomes uneconomical. The system still needs fine tuning of cause, but we don’t have the same problems as you mention. Todays turbines are equipped with a full converter, so the generator is decoupled from the grid through a DC link. Power electronics and computers in the turbine make sure that the DC is turned into the desired AC again. A converter can set the phase angle as desired, and hence deliver reactive power to the grid. Even when they are stopped they can do this partly. So no browout over Europe. The manufacturer warrants a availability factor of at least 95%. For older turbines it is different. In order to conclude anything on turbine availability in the field, I think it best to have data. I am an engineer too, and I am proud of what we can do and wind energy is a very interesting field. A report from the Danish think tank CEPOS has gotten a lot of attention lately. However it has been heavily criticized by experts in Denmark, on the facts, conclusions and the fact that it was paid for by the oil industry. Wind energy is not the answer to everything. But it may be part of an answer to something. Wind energy is not perfect yet. But in thirty years it has come a long way. But there is also a message in that. As with many other energy sources, they take time to develop into something that is economical viable. The price of energy is not a hardcoded truth, but a variable that varies according to the cheapest alternatives. These are oil, coal and gas. Oil being the far most important of the three is the gold standard and the price varies with demand and supply. EIA has recently made public that they believe in a peak oil production within the next 20 years and that is a first for EIA. We have also seen how no new oil fields in the giant or super giant class has been found since the 80’s, e.g. we’re long past peak discovery. Looking at the North Sea, the US and other early oil sites we know that after a peak discovery comes peak production. We have seen in the time leading up to the financial crisis, that Saudi Arabia with 13% of the worlds reserves could not turn production up and hence the price of oil soared to over 100 USD a barrel and stayed there. With a looming oil peak on the horizon and the roaring economic growth of India, China and South East Asia that fuels a rise in demand, we know that oil will become more expensive and we have to fight over the leftovers. We have already fought two wars in modern times, to secure supply of cheap oil. Our sons and daughters died so we could fill the tank of the SUV with reasonably cheap gas (and Cheney’s Haliburton could make billions in windfall profits). The price has been an alienating of the Arab world and a rise in the treat of terrorism. All this for cheap oil, cheap energy. When the price of oil goes up, the price of natural gas also goes up and partly also for coal and demand moves to the cheapest alternative. So expensive oil means expensive fossil energy. Coal is there in plenty, but even when you don’t look at co2 emissions, it is still a dirty fuel. The particle emissions from coal is accused of causing lung diseases. It is difficult to see where a given particle came from and which particle caused the disease. But we can measure them in the air and coal contributes. Diseases and deaths cost money. So from a society perspective, this adds a price premium to coal, that is hidden in the health care costs. Nuclear takes a long time to build and hence the demand changes slowly. Nuclear has a lot of potential and we should add more of this to our energy mix. But nuclear cannot serve all the worlds energy demand, but only some of it, as there is limited uranium reserves. Fusion, the other nuclear energy, was 50 years out 50 years ago and today it is still 50 years out, hence it is not the lifeboat. Power from coal, oil and gas means that a big part of the electricity price is made up of variable costs, e.g. the cost of the fuel. The money paid for the fuel goes to the country where the fuel came from. In Denmark we have oil and gas (but production is dropping), but no coal. In the US you have coal but not a lot of oil or gas. Wind energy means that the fuel is free. The machine that tap into this energy source is the thing that costs money. So the electricity price of wind energy is mostly made up of fixed costs and only minor variable costs (O&M), hence it is stable. The money paid for the wind turbine goes to where the parts where produced. Most wind turbine manufacturers have regional production and regional supply networks, as they are too expensive to transport around the world. So in essence, the money paid for wind electricity stays in the region for the most part. There are other renewable sources of energy, but all have their own problems. Many of the technologies have potential but still have a long way to go, before delivering energy at a reasonable price. One thing is possible though. To save energy. In Denmark we uses about half the energy per person as in the United States. This means that both private citizens uses less energy but also that our companies are more energy efficient. This is properly due to that fact that energy cost more over here, and then it makes a difference how much you use. With a higher energy price, this will come naturally. Wind has come a long way the last thirty years. From simple 5KW machines to today’s mainstream 3MW machines. Today it is complicated machinery where you can find cutting edge technology within materials, testing, computer control just to mention a few. And the machines have become better at extracting energy at lower wind speeds and will continue to do so in the future. The cost of energy produced has gone down significantly. While still requiring subsidies it is now in the range of the commercial energy sources. However none of these solve the basic problem, that some times the wind blow too little. So the wind is not our answer to our energy needs, but it has the potential to be part of the future energy mix, part of the answer. There is an article in the Seattle Times on March 26 2010 by John Wallace of the Department of Atmospheric Science at the University of Washington [and thanks to Don Bishop to alerting us to it!] which reinforces the recommendations in our EOS article for a focus on a bottom-up emphasis on the vulnerability of key societal and environmental resources. This is in stark contrast to the incorrectly narrowly focus in the IPCC reports on the use of the top-down multi-decadal global model projections of impacts to resources due to their projections of climate change from the effects of added CO2 and a few other greenhouse gases. which provides more detail on this vulnerability perspective. TRAVELING in India the past two months has impressed on me the breadth and urgency of the world’s environmental crisis. After decades of sustained growth following the “green revolution” in the 1960s, Indian crop yields no longer keep up with population growth. Topsoil is becoming depleted of natural chemical nutrients so that increasing applications of chemical fertilizers are required to sustain high crop yields. Cropland is being lost to urbanization and topsoil is being stripped from fields to make bricks. Excess nitrogen from fertilizers in the runoff is polluting rivers and wetlands. Water tables are plummeting in response to shortsighted management practices such as “water mining” from deep wells to increase yields of dry-season crops. Some highly regarded Indian ecologists are concerned about the risk of future biodiversity losses because of the introduction of genetically engineered plant species. India’s tiger population is reportedly down to about 1,400. People are sickened by toxic waste from factories producing goods for consumption in developed countries. The list goes on. Media coverage of India’s looming environmental crisis has been eclipsed by the debate about long-term future impacts of global climate change. The revelation that the Himalayan glaciers are not retreating as rapidly as reported in the Fourth Assessment Report of the United Nations’ Intergovernmental Panel on Climate Change (IPCC) has been front-page news in India day after day. Readers of these news stories could easily come away with the impression that the immediacy of the environmental crisis has been exaggerated when, in fact, it is not being given sufficient emphasis. It’s tempting to blame the media for fixating on global warming, but we climate scientists are partly to blame for the misplaced emphasis. Over the past 20 years we have stood by and watched as governmental and nongovernmental organizations that deal with environmental issues became more and more narrowly focused on the long-term impacts of global warming. Meanwhile, more imminent issues relating to the sustainability of our planet’s life-support system under the pressures of growing human population and the widening gap between rich and poor are not getting the attention they deserve. By failing to foster creation of robust, broad-based advisory mechanisms, we have allowed the IPCC assessment reports to become the dominant vehicle for representing the views of the scientific community on a widening range of environmental issues. In the IPCC terminology, symptoms of environmental degradation, regardless of their cause, are labeled as impacts of climate change, and the societal response to them is framed in terms of mitigating and adapting to climate change. Scientists still write papers and speak to the media about environmental concerns outside of the purview of the IPCC, but with so much of the world’s attention riveted on climate change there is a lack of institutional infrastructure for calling attention to other issues. Labeling issues such as reduced agricultural productivity, loss of biodiversity, pollution and the looming shortage of fresh water as “impacts of global warming” leaves the public confused and susceptible to propaganda by groups who oppose environmental regulation of any kind. With the IPCC increasingly in the spotlight, the denialists can trivialize the entire environmental crisis simply by casting doubt on the scientific consensus on global warming. Climate scientists and their detractors are slugging it out every day in blogs and editorial pages while legislative initiatives to get governments to address environmental and resource issues remain stalled, despite broad public support for them. At the recent Copenhagen Summit, the nations of the world were reluctant to make binding agreements to reduce their production of greenhouse gases. Given the limited public understanding of the intricacies of climate science, the human tendency to be more concerned with current issues than with what the climate will be like 100 years from now, and the glaring inequities in per capita fossil fuel consumption between countries like the United States and those like India, justifying an enlightened energy policy on the basis of concerns about global warming is a tough sell. The negotiations might have gone better had the justification been framed in terms of conserving the world’s dwindling oil reserves, stabilizing oil prices and promoting energy independence. The current stalemate is likely to persist as long as scientists allow climate change to dominate the environmental policy agenda. In order to promote a more productive dialogue between scientists and policymakers, the discussion of adaptation and mitigation options in the policy arena needs to be reframed so that it addresses environmental degradation and sustainability in the broad sense, not just the impacts of climate change. John Michael Wallace is a professor and former chairman of the Department of Atmospheric Sciences at the University of Washington and a former co-director of the university’s Program on the Environment. Although the natural causes of climate variations and changes are undoubtedly important, the human influences are significant and involve a diverse range of first order climate forcings, including, but not limited to, the human input of carbon dioxide (CO2). Most, if not all, of these human influences on regional and global climate will continue to be of concern during the coming decades. Hypothesis 2b [which is the IPCC perspective] is although the natural causes of climate variations and changes are undoubtedly important, the human influences are significant and are dominated by the emissions into the atmosphere of greenhouse gases, the most important of which is CO2. The adverse impact of these gases on regional and global climate constitutes the primary climate issue for the coming decades. We therefore conclude that hypothesis 2a is better supported than hypothesis 2b, which is a policy that focuses on modulating carbon emissions. Hypothesis 2b as a framework to mitigate climate change will neglect the diversity of other, important first- order human climate forcings that also can have adverse effects on the climate system. We urge that these other climate forcings should also be considered with respect to mitigation and adaptation policies. UCAR has a press release of an upcoming article to appear in Science Express that further supports hypothesis 2a and refutes hypothesis 2b. Of course, these aerosols are part of climate change, but otherwise this article is quite correct in identifying yet another important human climate forcing beyond CO2 as well as emphasizing the importance of regional atmospheric circulations in the assessment of climate change. Clearly a global average surface temperature trend tells us nothing useful with respect to this climate effect. Biography of Francis Massen here. Atmospheric CO2 mixing ratios vary with latitude, regional specificities (as sea-side, continental or urban location) and time. 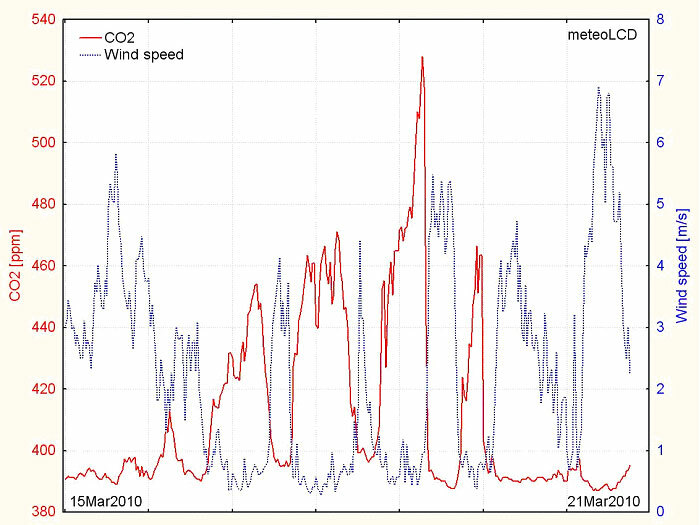 Daily values may differ by more than 40%, as can be seen in the first figure showing CO2 and wind speed time series at the meteorological station “meteoLCD” in Diekirch, Luxembourg (semi-rural environment). Figure 1: CO2 and wind speed values from 14 to 21 March 2010 in Diekirch, Luxembourg. The causes of these hefty variations are many: magnitude of wind speed, periods of boundary layer inversions, changing plant behavior (photosynthetic CO2 absorption or CO2 emissions by plant respiration) and human activity. When the boundary layer is well mixed up, CO2 levels tend to a reproducible minimum, which represents the regional background level and may even be close to the published global mean CO2 mixing ratio. The mixing up of the near ground layer is essentially caused by the wind: a plot of CO2 versus wind speed often has a typical boomerang shape, as shown in the second figure. Figure 2: Plot of CO2 versus wind-speed using the values of Fig.1. The background level can be thought as being the CO2 mixing ratio that would exist if wind speed was infinite. 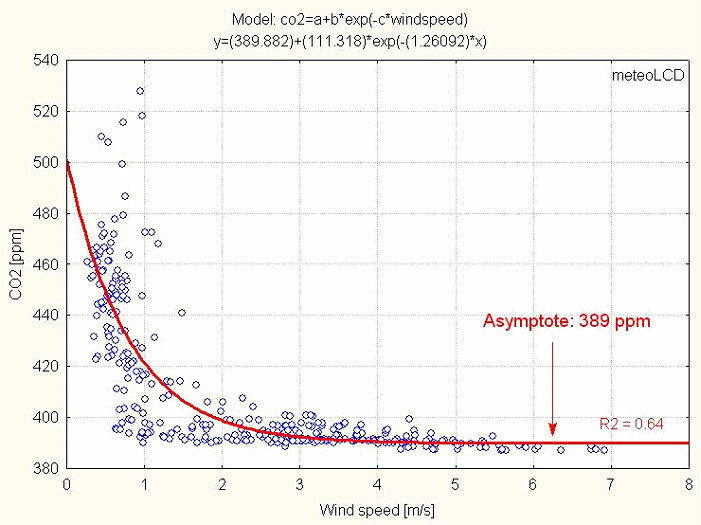 Simple visual inspection, or better, fitting the data to an exponential function of the type CO2 = a + b*exp(-c*windspeed) delivers this asymptotic CO2 level. In the example above, the model is statistically significant (R2 = 0.64) and suggests a regional background of 390 ppm (to be compared for instance to the 2009 seasonal corrected mean Mauna Loa level of approx. 388 ppm). The CO2 versus wind speed plot can also be used as a first step to validate historic CO2 measurements, made by chemical methods. One example is the very careful measurements done from 1939 to 1940 by W. Kreutz in the town of Giessen, Germany. Kreutz used a chemical gas analyzer having an accuracy better than 1.5% and also recorded the wind speed. The exponential fit points to a very high asymptotic level of 398 ppm, well in excess to the consensus value of 310 ppm derived from the ice-cores. This CO2 background problem is studied in a peer reviewed paper I presented with E. Beck as coauthor (Beck is a specialist of historical CO2 measurements) at the online conference Klima2009 organized in Nov. 2009 by the University of Applied Sciences of Hamburg, Germany. Our paper “Accurate estimation of CO2background level from near-ground measurements at non-mixed environments” was rewarded “Best Paper” among the 103 contributions. A slightly edited version will be published in an upcoming book “Social, Economic and Political Aspects of Climate Change” (editor: Prof. Walter Leal, Springer Verlag).